If you are like me, you may feel rather cautious and leery about BPA, PVC, and pthalate-free plastics – especially when it comes to baby teethers. I am frankly always worried about the next toxin of the moment, and try to play it safe by basically opting for non-plastic baby and nursery products whenever possible. Thankfully, with regards to truly eco-friendly teethers, there are a variety of desirable and affordable options available for baby’s budding teeth and your peace of mind! A classic from France is the Sophie the giraffe teether, made of 100% natural rubber from the Hevea tree and colored with food paint. ‘Sophie’ is excruciatingly cute and thoughtfully crafted. The dark and light bespeckled body is designed for visual stimulation for baby’s developing vision. Her nubby horns and legs provide soothing relief for gums and satisfy the urge to chew while teething. The 100% natural rubber also gives her a pleasant distinct aroma. Sophie makes a little squeal when squeezed, which aids in the development of babies’ sense of hearing and their understanding of cause and effect. A rather endearing teether indeed! Another great teether designed by a fellow mom, is based on the concept of wetting a corner of a washcloth, then putting it in the freezer – creating an icy, cold refreshing and soothing teether. 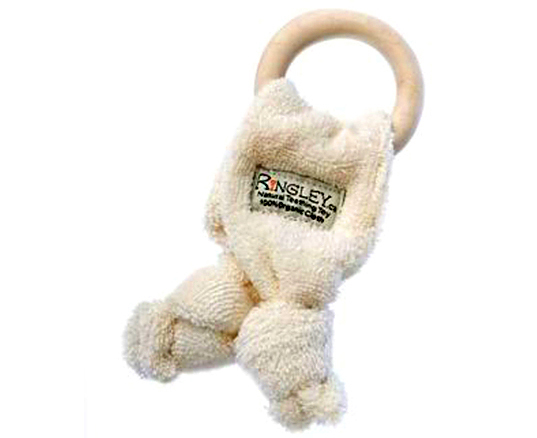 The Ringley Natural Teething Toy has a ring made of natural, Canadian maple with an organic cotton terry cloth swatch attached to it. Baby is exposed to two very safe and appealing textures. The terry cloth swatch comes both – with or without knots – and retails for $14.99 at Kai Kids. 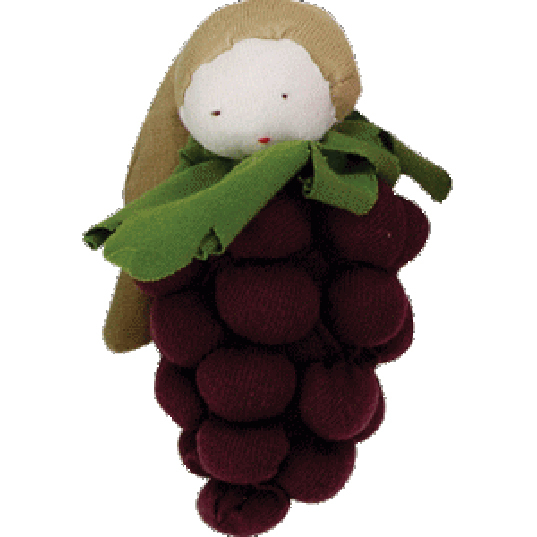 Other organic cloth teethers include the deliciously cute “veggie” and “fruit” line from Under the Nile. 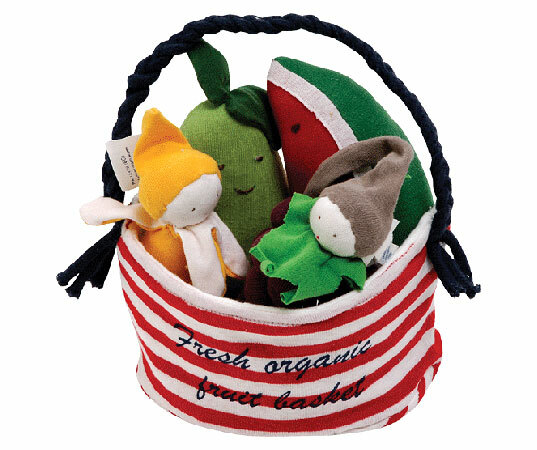 Stuffed with and made of 100% organic Egyptian cotton, these teethers are very safe and tasty. Even better? They sell for only $6.00 individually. 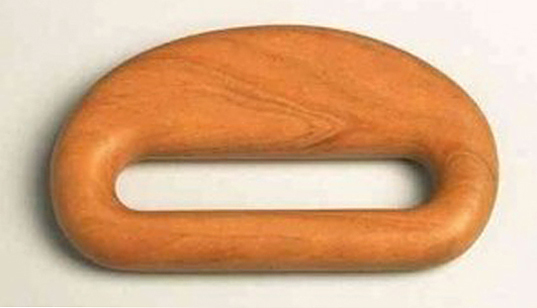 Of course, wooden teethers are not to be overlooked. 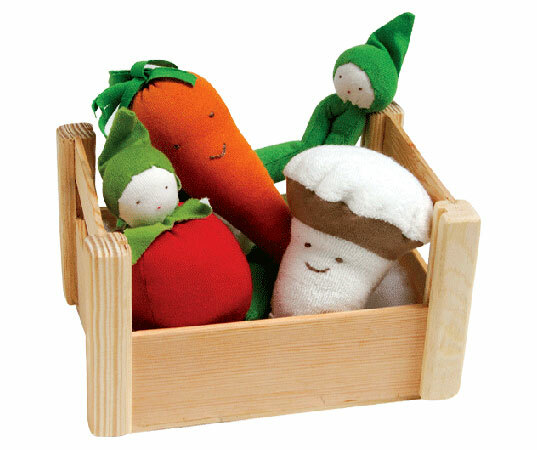 I think that they are absolutely gorgeous, and I particularly love the hand-crafted designs from Etsy’s Stump Pond Toys. With all of these gorgeous and mindful designs, you don’t have to give plastic a second thought! FYI..WARNING! a nanny friend of mine pulled a "sophie the giraffe" out of her charges mouth because she was choking and turning blue. apparently the head is air filled and babies can clamp down on it and it can re-fill with air once in their mouths. she wrote an email to the american distributer and heard back that they will not stop selling them because they are so popular. thank you so much for the warning about sophie the giraffe, great to know. i think many toys can be some sort of a choking hazard. i don't disagree that sophie the giraffe could have caused a child to choke, but i have this toy and my son absolutely loves it. because of the natural rubber texture, he loves to chomp on it and make squeaky noises on it with his two bottom teeth. i've never had a problem with this toy. I love the idea of wooden chew toys, but treating them with mineral oil makes me nervous. Mineral oil is unsafe for adults, and especially for my developing children. If you are like me, you may feel rather cautious and leery about BPA, PVC, and pthalate-free plastics -� especially when it comes to baby teethers. I am frankly always worried about the next toxin of the moment, and�try to play it safe by basically opting for non-plastic baby and nursery�products whenever possible.�Thankfully, with regards to truly eco-friendly teethers, there are a variety of desirable and affordable options available for baby's budding teeth and your peace of mind!